Before washing, drying or ironing an item of clothing, it is a good idea to read the label. Doing so can help you avoid creating felted jumpers, turning formerly white sheets pink, or shrinking trousers into shorts. Knowing the meaning of the symbols on the clothing labels helps to avoid unwanted results, even if the labels are not always clear and easy to understand. Before we start, a general rule: if the item is made up of more than one fabric, you should follow the instructions that apply to the most delicate part. Getting the temperature and wash cycle right is important for seeing great laundry results, and can even prevent damage to your clothes. 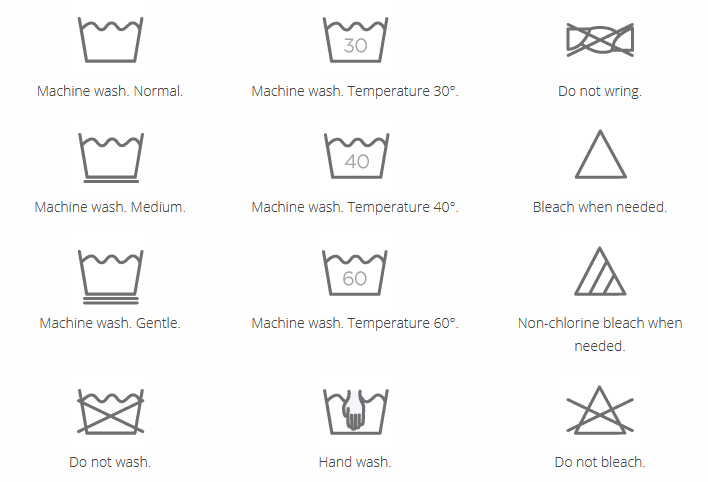 The clothes washing symbols below can give you an idea for temperature, indicated by the number of dots in the tub of water symbol, whereas different cycle types are represented by a tub with one or two lines drawn under it. Drying is an important part of the clothing care process. Knowing your dryer symbols, like the square with a circle in the middle that indicates tumble drying allowed, can help you avoid putting the wrong garment in the tumble dryer. Other symbols can give you additional information, such as a square with a horizontal line in the middle means you should dry the item flat, or the crossed-out twisted symbol, which tells you not to wring the garment. The temperature is given by the increasing number of dots inside a circle. If you want to use bleach, you’ll want to take a look at your garment’s fabric care label to see if there is a bleach symbol, given by a triangle or more importantly a do not bleach symbol, a triangle crossed out. Recognizing these signs can save your garment from getting permanently damaged by chlorine bleach. Some fabrics look great after ironing but others, like more delicate materials, can be damaged. There are even some fabrics that simply need special care when ironing. 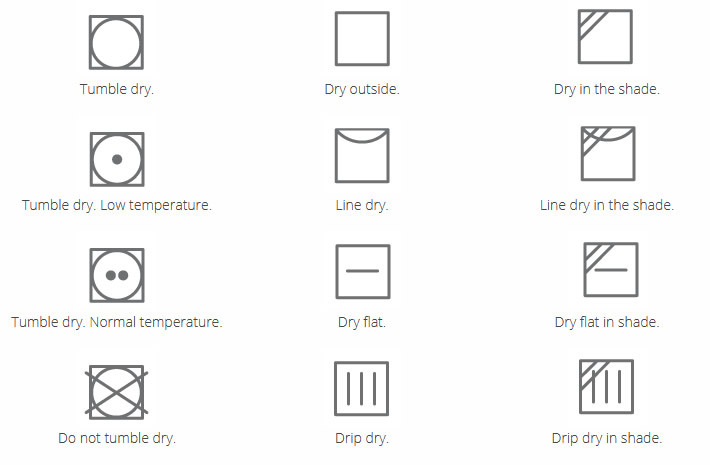 For example, if you want to iron your new dress shirt and you want to know if it can be ironed safely, look out for the iron symbol on your garment, represented by a little iron symbol with dots in the middle that denote the temperature setting, like those shown below. All You Need To Know About The Origin Of Mariners _ Ndị Mmiri / A Proffessional Househelp/driver / Nigerian Teenager, 18, Jailed 12 Years For Part Taken In Murder Of 15 Year Old.